Arjohuntleigh's four-point spreader bar system is also available with the enhancement of Powered Dynamic Positioning System (PDPS). 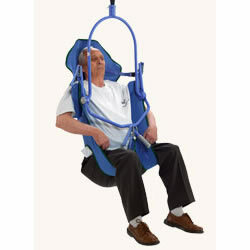 A system that powers the resident into their required position while keeping the sling and resident as steady as possible during maneuvers, without any strain for the caregiver. With the effortless touch of a button, powered positioning of the resident can be achieved during raising or lowering of the lift. Sitting a resident up in bed, one of the most common tasks a caregiver has to perform, can be carried out with ease while maintaining a good working posture and promoting good working techniques. The Powered DPS power lock prevents unnecessary movement of the patient, even if he or she is restless or agitated during the transfer. 600 lb capacity.